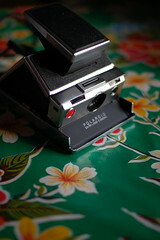 interesting article on the marketing of old polaroid technology to young photographers. while i frequent both polanoid and unsaleable (well, at the latter i sporadically go and look, fill my basket then empty it again as i'm unable to justify the cost, then wander off to ebay and get distracted by something else entirely... but i digress!) i wasn't aware that they were affiliated - and part of a co-ordinated marketing push, according to photoicon. i for one am all in favour of this kind of niche marketing/hype/whatever, if it can support the continued production of a variety of weird and wonderful film formats long after mass consumption is history. unfortunately that also means those who want it generally find themselves paying over the odds for the privilege. i cottoned on to sx-70s after seeing the polaroid kid's pictures in jpg last year and realising that polaroid doesn't have to mean crappy. aside from the photographer's skill in producing such engaging portraits, the sharp focus and shallow dof that the camera can give were a real eye opener for me (although my manual focusing isn't a patch on the sonar it turns out :roll: ). that and the fact that the cameras are such desirable objects and amazing pieces of engineering had me sold. i managed to pick up some sx-70 film on ebay for a song (it can still happen!) and while i do really love those blues *dreamy sigh* i'm not confident enough in my ability to make the most of the film to be prepared to pay the huge premium it now commands. i'm happy to carry on using 600 film with a pack filter, although i wonder whether there's a real loss of sharpness due to the thickness of the filter - all my sharpest shots are on time zero. perhaps i should ask santa for a pack of blend film so i can compare and contrast?